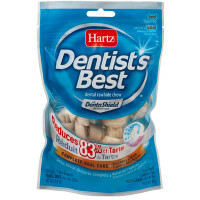 The Hartz Dental Chew for dogs helps you provide your dog with healthy oral hygiene. 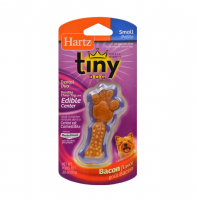 This Hartz Chew helps your dog's teeth stay clean while blocking tartar. Consisting of natural corn starch with no plastic fillers, the 4.94-oz Hartz Dental Chew has an artificial bacon flavor to appeal to pets. 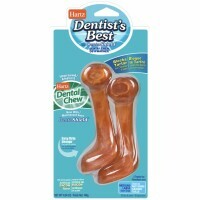 Constructed with an easy grip design, this dental chew for dogs is made to be easily gripped by your pet. 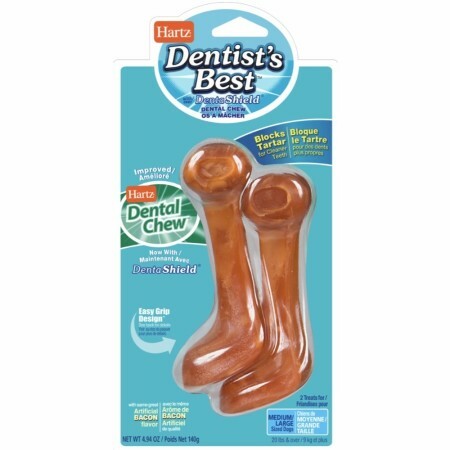 Ingredients: Cornstarch, Sorbitol, Maltose, Rice Starch, Artificial Bacon Flavor, Sodium Hexametaphosphate, Color Added (Yellow #6).